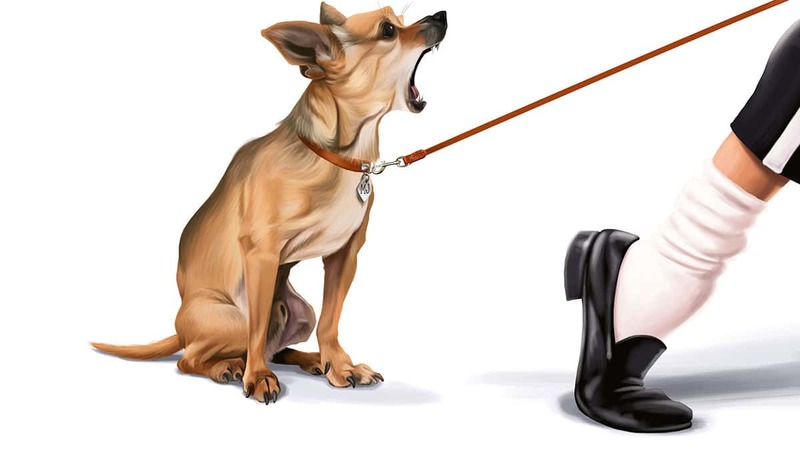 In early September Brazilian advertising agency, BlackNinja, contacted me, in regards to my Elke Vogelsang caricature. They sought to hire me to design and build two new (maybe three) caricatures for a Noise Reduction advert for a sound company. The idea was to have famous celebrities in situations that would make it hard for them to continue to function as singers. After some discussion it was planned that the two starter caricatures would be those of Amy Winehouse and Michael Jackson. The basic brief was to have Amy Winehouse trying to regain a microphone from a screaming child in carriage. 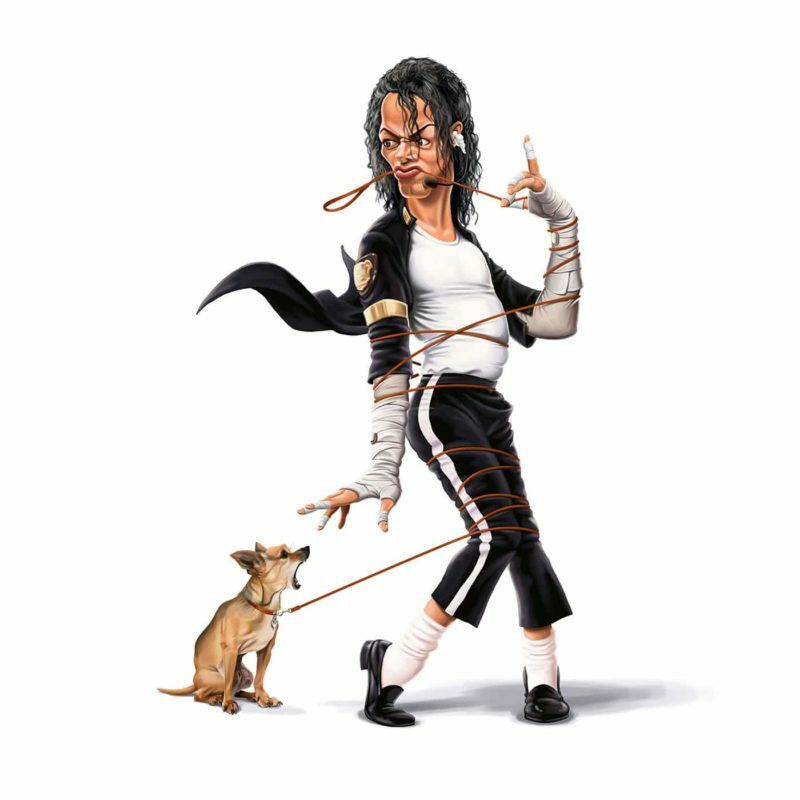 For Michael Jackson, it was designed to have him wrapped in a dog leash, with the dog in attendance and barking his head off. Due to the nature of the commission it was decided to repeat much the same procedure as Elke‘s caricature, by having them on white. This would then be passed to the client with a transparent background, just in case there was aneed to make the background more detailed. So these would be output as TIFF and PNGs. Michael Jackson, I have to say, is not my favourite performer and singer, but I had to be as objective as possible with this brief. However, even the client made the comment; “I don’t know which Michael Jackson you will do.” I opted to do a cross between some of his later years looks. I maintained the darkish skin, but did a combination of clothes and poses i found in several images for his face and dance stance. The brief stated it had to be tied in a leash, which made the feel of him doing is dance and movement pretty hard, and this is one of the strong characteristics of his form. After the Amy was complete and OK’ed by the client it was time to render up Michael. Michael took a lot of pre-drawing research to look at all his dance poses. I knew he had to be wrapped in the leash so it was important to make it look like that, but at the same time give that classic Michael Jackson look in his moves. After some research I found stage performance shot close to the final render, and the pencil work was done. The costume that was in the performance wasn’t as interesting as I wanted, so I wanted to tie together several looks to cross the ability to make the pose more exciting. This worked well, and the final aspect of the drawing of Michael was to capture several shots of my own hands to use as guidance for his pose. Again, this worked well, and the aditional bandage and plasters were added into the drawing. The final aspect of the drawing was the dog. Now, I took the lead on this and chose a small dog to be the annoyance. Mainly as I thought the bark would be more high pitch and affect sound more. And secondly, because I thought the size would be more humorous as it isn’t an intimidating size, but the presence was the threat with the noise. The process of drawing Michael‘s face was the hardest part of the project. Mainly the issues arose from the fact that he has so many variations to his face, that are all recognisable and iconic. I found an image of Michael in roughly the right kind of facial characterisation (that of a scrunched face – seen left) and so based the design around that. The body was built out of several photos that were found that showed typical positioning and styles of Michael in his dance moves. As it was important to show the idea that Michael was trapped by the lead I chose to use images of him dancing on his toes, that when combined with the leash looked like he was trying to move, but couldn’t. Even though recently I made a purchase to buy a set of oil brushes to work in Photoshop with, I have developed a technique that suits my method of painting, and rely on one brush only for this painting style. The funny part is that it is not a brush that emulates a real brush, instead it is intended for fur. My thoughts were, as I can do multiple strokes it is much the same as a real brush, which is made up of hairs. To help the process along, I set the opacity and flow lower than 100%. This is to aid in the blending of colour at their cross-over points. It should be pointed out that these images, and this one in particular, are in the region of 19,000px wide. As part of the process of every caricature I do, I prepare a screen capture from every possible interesting part of the image, as it’s being painted. I then collate these into an animated gif, hoping to help show the process by which I do my images. Most of the time, I begin with the eyes and then complete the faces. As there were two face, you will see that these were all completed first before I attempt any of the other parts (although I do block in parts). The reason being is that the faces, and especially the eyes, are a focus on a viewers captivation of an image. So if these are weak then the rest of the image will fail. Detailing Michael was based on a combination of things. As stated previously, the choice of ‘which’ Michael to choose came down to the median value of his colour changes. This also helped with the streaking hair look and feel. So the colours were sampled from an image of a performance (you can se above) and the rest were spotted from other images. It was a little difficult as there were not many good images that could be used. The dog was sampled from a found image, but as it was slightly different in appearance, it had to blend a great deal of the body to match. Michael took more layers than Amy to complete. Mainly as the process was more a case or patching things together and so was needing a little more caution.